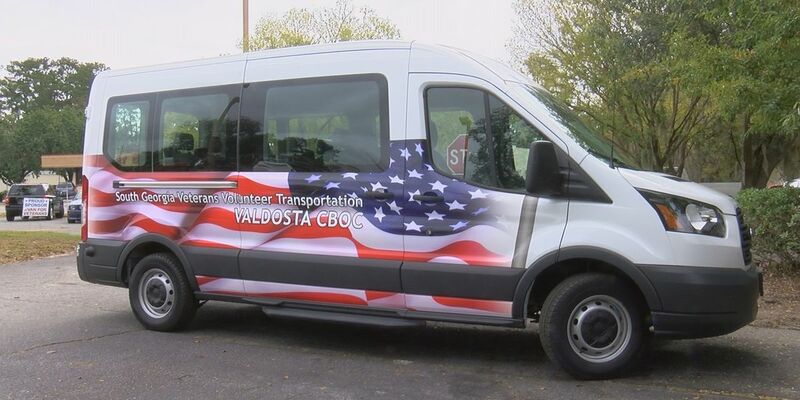 VALDOSTA, GA (WALB) - One South Georgia organization raised about $38,000 to donate a van to the Veteran Affairs clinic in Valdosta. On Thursday, the community held a gathering to present the van to the clinic. “For the past five years I’ve been driving down. The van’s getting more and more miles on it and starting to be in somewhat disrepair. We had a few breakdowns, so we were kind of led to reach out to the community to see if we can get donations made in an effort to buy a new van," said Tim Coombs, the co-chair of the Community Veterans Engagement Board. The organization came together with community to help raise money for a 12-passenger van for the VA clinic. “It came together, we thought kind of slow, but they told us it was pretty fast to raise this much money to get a beautiful van like that," said Coombs. The van is used to transport veterans from the VA clinic in Valdosta to the VA hospital in Lake Park. “Appointments are great but if they can’t physically get there, people say, ‘Why do you go there?’ Well that’s just where these guys are assigned to go. That’s their hospital," said Coombs. With the help of many groups and people from the community, they were able to raise $38,000 for the new van. “We reached out to the community here in Valdosta and acquired the rest of the donations. Hahira, Tifton, Moultrie and were able to purchase a brand new van through Robert Hutson Ford," said Coombs. Coombs jokes that it took everyone in South Georgia to get this done and the veterans said they appreciate it. “I’ve known the community to be very concerned but this was beyond my wildest dreams to see how they came together in such a short time to give us the transportation we needed," said veteran Wilmon Stanley. Having used a bus for the past 20 years, Stanley said he’s going to continue to put the bus to good use. “And I’m not too far from having an appointment in Gainesville coming up shortly and I will be on that bus," said Stanley. And those veterans make it worth it all. “We need to give back. I felt like I needed to give back all I could. They gave so much for our country. A lot of people may not appreciate that, but you know coming up on Veterans Day, it’s really important and I feel really good after doing this," said Coombs. Coombs shared that their efforts don’t stop there. The VA clinic in Waycross has reached out and may be looking to follow suit in trying to raise money to get its clinic a new van.